Post-doctoral researchers often serve as role models for graduate students - helping to guide them through the rigors of their graduate degree program and teach them the skills they need to know in the laboratory. A dynamic partnership that formed in ECOGIG director Dr. Mandy Joye's research laboratory at the University of Georgia extends beyond the traditional relationship that you might expect between a post-doc and a graduate student. "He is more my brother than my colleague" says post-doc Guang-Chao Zhuang of graduate student Andy Montgomery. "We often make fun of each other during [expeditions], but we trust each other, help each other's experiments and enjoy working with each other." It is clear the two of them enjoy working together and seem to be quite the dynamic duo when it comes to marine research. In 2018 alone, the two of them have published four research papers on low molecular weight compounds and their importance in environmental systems, plus have two more have been recently accepted for publication. "We have shown that low molecular weight compounds are important carbon sources in marine waters and sediments. The process of designing the experiments was interesting, because some of the methods did not exist to answer our questions, so [Guang-Chao] had to design ways to measure processes that hadn't been captured before" says Andy about their research together. "As a young scientist, I look up to him in many ways, including his work ethic, his passion, and his willingness to help me learn and grow as a graduate student." 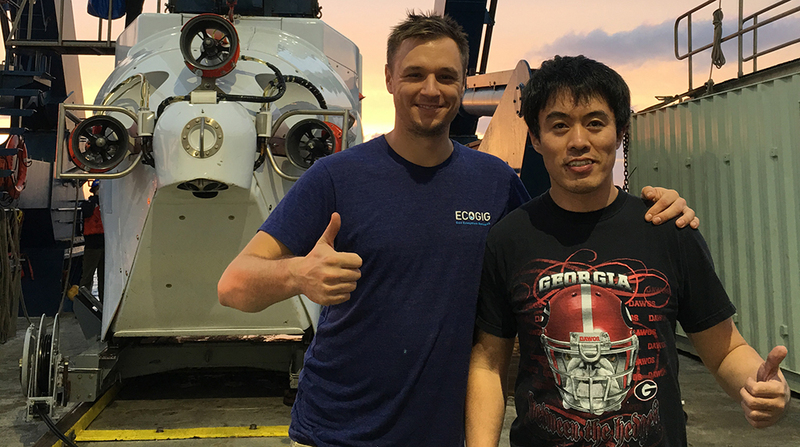 This dynamic duo have already been on four research expeditions together, in the Gulf of Mexico and the Gulf of California. They recently embarked on a fifth in the Gulf of Mexico aboard the R/V Falkor (owned and operated by Schmidt Ocean Institute). The work they are doing there will help generate data for Andy's PhD and a few more research papers in 2019, including one with Andy listed as first author. They both acknowledge that this is a team effort and are grateful for the support from Joye as well as other members of their research lab. "The standard that Mandy holds us to is very high, which means we work hard to make our experiments and data as polished as possible. The ideas and direction she offers have inspired us to pursue effection questions" says Andy of his graduate advisor. "[Mandy] always makes me feel like she is on my side in scientific exploration" says Guang-Chao. Both of them hope to continue their collaborations together even after their time in the Joye lab is over. We can't wait to see what the future holds for this dynamic duo!